3D printing technology provides a faster, better and more affordable technique to creating a one-to-one replica of a patient’s mouth. Georgia-based Specialty Appliances is an advanced digital dental lab that produces high-quality orthodontic appliances and dental models that has adopted 3D printing technology into its daily workflow. Using both the Objet Eden260V and Eden500V 3D printers from Stratasys, the company is able to mass produce accurate and durable dental models using VeroDentPlus material, resulting in fewer appointments and shorter treatment time for patients. Specialty Appliances’ first 3D printer was the Objet Eden 260V from Stratasys in 2011 and saw an increase in printer usage in cases from 6% to 24% in just 18 months. The company now uses three Objet 3D printers in-house. Traditional stone models usually take a week to produce from an impression. With 3D printing, models can be ready on the same day that the scan is created. Other benefits of 3D printing over stone models include a high level of accuracy and durability. 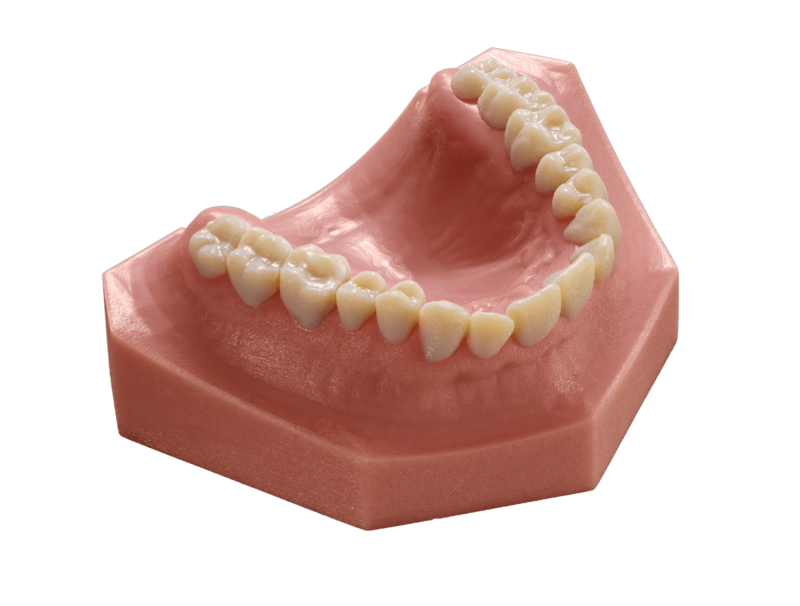 With a 3D scan, Specialty Appliances can produce dental models from intraoral scan data with a resolution that is within 40 microns of dimensions of the patient’s actual teeth. The durability of 3D printed dental models also prevent crumbling and deterioration as with stone models. The Objet 3D printer allows Specialty Appliances to make multiple models on a single print, increasing productivity while spending less. One of the most notable benefits is the need for fewer appointments and less treatment time for patients. In other words, patients can get their braces off sooner and avoid potential relapse or movement of the teeth between procedures.